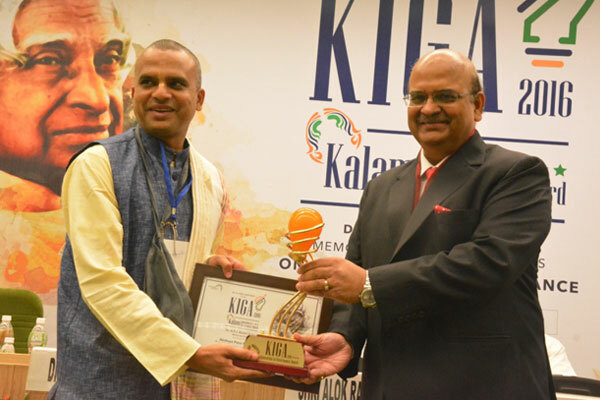 On October 15, 2016, The Akshaya Patra Foundation was awarded the prestigious Kalam Innovation in Governance Award 2016 (KIGA 2016). The award was presented during the 1st Edition of Dr APJ Abdul Kalam Memorial Summit on ‘Innovation in Governance’ held at Vigyan Bhawan, New Delhi. Shri Bharatarshabha Dasa, Director - Relationships of Akshaya Patra was present at the occasion to receive the award – established in the memory of 11th President of India – Dr APJ Abdul Kalam. The award was handed out by Mr Alok Ranjan, Chairperson of Kalam Centre and Former Chief Secretary of Uttar Pradesh. “We feel honoured to receive the 1st Edition of Dr APJ Abdul Kalam Memorial Award for ‘Innovation in Governance’ category. This award will inspire us to reach out to more children,” expressed Shridhar Venkat, CEO of Akshaya Patra. Akshaya Patra which operates the world’s largest NGO-run Mid-Day Meal Programme is grateful to have received this prestigious award. We would like to thank the KIGA Summit and its panel for recognising Akshaya Patra’s role in building a better future for children, improving governance and delivering value.